As well as extending the trail, the City of Greater Bendigo has also been upgrading the existing trail surface, to repair the likes of stormwater damage hazards etc. Lately, they’ve been working in Bendigo East and the Junortoun area, between Markovich Lane and Bennetts Road. The results are impressive – congratulations to council. 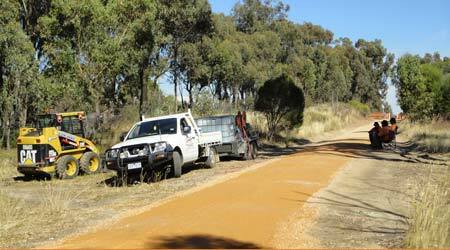 The Friends and trail users have highlighted a number of the trail sections that require maintenance upgrades, so we hope the Bendigo councillors will approve adequate funds for trail maintenance in the 2013-14 budget. looks great but not for long as the trail bikes are churning it up.